Bovine spongiform encephalopathy (BSE), commonly known as mad cow disease, is a neurodegenerative disease of cattle. Symptoms include abnormal behavior, trouble walking, and weight loss. Later in the course the cow becomes unable to move. The time between infection and onset of symptoms is generally four to five years. Time from onset of symptoms to death is generally weeks to months. Spread to humans is believed to result in variant Creutzfeldt–Jakob disease (vCJD). As of 2018 a total of 231 cases of vCJD have been reported globally. BSE is due to an infection by a misfolded protein, known as a prion. Cattle are believed to have been infected by being fed meat-and-bone meal (MBM) that contained the remains of other cattle who spontaneously developed the disease or scrapie-infected sheep products. The outbreak increased throughout the United Kingdom due to the practice of feeding meat-and-bone meal to young calves of dairy cows. Cases are suspected based on symptoms and confirmed by examination of the brain. Cases are classified as classic or atypical, with the latter divided into H- and L types. It is a type of transmissible spongiform encephalopathy (TSE). Efforts to prevent the disease in the UK include not allowing any animal older than 30 months to enter either the human food or animal feed supply. In Europe all cattle over 30 months must be tested if they will become human food. In North America tissue of concern, known as specified risk material, may not be added to animal feed or pet food. About 4.4 million cows were killed during the eradication program in the UK. Four cases were reported globally in 2017 and the condition has been deemed to be nearly eradicated. In the United Kingdom, from 1986 to 2015, more than 184,000 cattle were diagnosed with the peak of new cases occurring in 1993. A few thousand additional cases have been reported in other regions of the world. It is believed that a few million cattle with the condition likely entered the food supply during the outbreak. This cow with BSE displays abnormal posturing and weight loss. 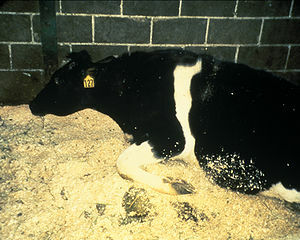 Signs are not seen immediately in cattle due to the disease's extremely long incubation period. Some cattle have been observed to have an abnormal gait, changes in behavior, tremors and hyper-responsiveness to certain stimuli. Hindlimb ataxia affects the animal’s gait and occurs when muscle control is lost. This results in poor balance and coordination. Behavioural changes may include aggression, anxiety relating to certain situations, nervousness, frenzy or an overall change in temperament. Some rare but previously observed signs also include persistent pacing, rubbing or licking. Additionally, nonspecific signs have also been observed which include weight loss, decreased milk production, lameness, ear infections and teeth grinding due to pain. Some animals may show a combination of these signs, while others may only be observed demonstrating one of the many reported. Once clinical signs arise, they typically get worse over the subsequent weeks and months, eventually leading to recumbency, coma and death. BSE is due to an infection by a misfolded protein, known as a prion. Cattle are believed to have been infected from being fed meat and bone meal (MBM) that contained the remains of other cattle who spontaneously developed the disease or scrapie-infected sheep products. The outbreak increased throughout the United Kingdom due to the practice of feeding meat-and-bone meal to young calves of dairy cows. 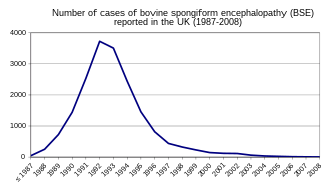 Prions replicate by causing other normally folded proteins of the same type to take on their misfolded shape, which then go on to do the same, leading to an exponential chain reaction. Eventually, the prions aggregate into an alpha helical, beta pleated sheet, which is thought to be toxic to brain cells. The agent is not destroyed even if the beef or material containing it is cooked or heat-treated. Transmission can occur when healthy animals come in contact with tainted tissues from others with the disease. In the brain, the agent causes native cellular prion protein to deform into the misfolded state, which then goes on to deform further prion protein in an exponential cascade. This results in protein aggregates, which then form dense plaque fibers. Brain cells begin to die off in massive numbers, eventually leading to the microscopic appearance of "holes" in the brain, degeneration of physical and mental abilities, and ultimately death. The British Government enquiry took the view the cause was not scrapie, as had originally been postulated, but was some event in the 1970s that was not possible to identify. Spread to humans is believed to result in variant Creutzfeldt–Jakob disease (vCJD). The agent can be transmitted to humans by eating food contaminated with it. The highest risk to humans is believed to be from eating food contaminated with the brain, spinal cord, or digestive tract though any tissue may be involved. The pathogenesis of BSE is not well understood or documented like other diseases of this nature. Even though BSE is a disease that results in neurological defects, its pathogenesis occurs in areas that reside outside of the nervous system. There was a strong deposition of PrPSc initially located in the Ileal Peyer’s patches of the small intestine. The lymphatic system has been identified in the pathogenesis of scrapies. It has not, however, been determined to be an essential part of the pathogenesis of BSE. The Ileal Peyer’s patches have been the only organ from this system that has been found to play a major role in the pathogenesis. Infectivity of the Ileal Peyer's patches has been observed as early as 4 months after inoculation. PrPSc accumulation was found to occur mostly in tangible body macrophages of the Ileal Peyer’s patches. Tangible body macrophages involved in PrPSc clearance are thought to play a role in PrPSc accumulation in the Peyer’s patches. Accumulation of PrPSc was also found in follicular dendritic cells; however, it was of a lesser degree. Six months after inoculation, there was no infectivity in any tissues, only that of the ileum. This led researchers to believe that the disease agent replicates here. In naturally confirmed cases, there have been no reports of infectivity in the Ileal Peyer’s patches. Generally, in clinical experiments, high doses of the disease are administered. In natural cases, it was hypothesized that low doses of the agent were present, and therefore, infectivity could not be observed. In 2010, a team from New York described detection of PrPSc even when initially present at only one part in a hundred billion (10−11) in brain tissue. The method combines amplification with a novel technology called surround optical fiber immunoassay and some specific antibodies against PrPSc. After amplifying and then concentrating any PrPSc, the samples are labelled with a fluorescent dye using an antibody for specificity and then finally loaded into a microcapillary tube. This tube is placed in a specially constructed apparatus so it is totally surrounded by optical fibres to capture all light emitted once the dye is excited using a laser. The technique allowed detection of PrPSc after many fewer cycles of conversion than others have achieved, substantially reducing the possibility of artifacts, as well as speeding up the assay. The researchers also tested their method on blood samples from apparently healthy sheep that went on to develop scrapie. The animals’ brains were analysed once any signs became apparent. The researchers could, therefore, compare results from brain tissue and blood taken once the animals exhibited signs of the diseases, with blood obtained earlier in the animals’ lives, and from uninfected animals. The results showed very clearly that PrPSc could be detected in the blood of animals long before the signs appeared. After further development and testing, this method could be of great value in surveillance as a blood- or urine-based screening test for BSE. BSE is a transmissible disease that primarily affects the central nervous system; it is a form of transmissible spongiform encephalopathy, like Creutzfeldt–Jakob disease and kuru in humans and scrapie in sheep, and chronic wasting disease in deer. A ban on feeding meat and bone meal to cattle has resulted in a strong reduction in cases in countries where the disease has been present. In disease-free countries, control relies on import control, feeding regulations, and surveillance measures. The tests used for detecting BSE vary considerably, as do the regulations in various jurisdictions for when, and which cattle, must be tested. For instance in the EU, the cattle tested are older (30 months or older), while many cattle are slaughtered younger than that. At the opposite end of the scale, Japan tests all cattle at the time of slaughter. Tests are also difficult, as the altered prion protein has very low levels in blood or urine, and no other signal has been found. Newer tests[specify] are faster, more sensitive, and cheaper, so future figures possibly may be more comprehensive. Even so, currently the only reliable test is examination of tissues during a necropsy. The first reported case in North America was in December 1993 from Alberta, Canada. Another Canadian case was reported in May 2003. The first known U.S. occurrence came in December of the same year, though it was later confirmed to be a cow of Canadian origin imported to the U.S. The cow was slaughtered on a farm near Yakima, Washington. The cow was included in the United States Department of Agriculture's surveillance program, specifically targeting cattle with BSE. Canada announced two additional cases of BSE from Alberta in early 2005. In June 2005, John R. Clifford, chief veterinary officer for the United States Department of Agriculture animal health inspection service, confirmed a fully domestic case of BSE in Texas. Soybean meal is cheap and plentiful in the United States, and cottonseed meal (1.5 million tons of which are produced in the U.S. every year, none of which is suitable for humans or any other simple-stomach animals) is even cheaper than soybean meal. Historically, meat and bone meal, blood meal, and meat scraps have almost always commanded a higher price as a feed additive than oilseed meals in the U.S., so not much incentive existed to use animal products to feed ruminants. As a result, the use of animal byproduct feeds was never common, as it was in Europe. However, U.S. regulations only partially prohibited the use of animal byproducts in feed. In 1997, regulations prohibited the feeding of mammalian byproducts to ruminants such as cattle and goats. However, the byproducts of ruminants can still be legally fed to pets or other livestock, including pigs and poultry. In addition, it is legal for ruminants to be fed byproducts from some of these animals. Because of this, some authors have suggested that under certain conditions, it is still possible for BSE incidence to increase in U.S. cattle. In February 2001, the US Government Accountability Office reported the FDA, which is responsible for regulating feed, had not adequately enforced the various bans. Compliance with the regulations was shown to be extremely poor before the discovery of the cow in Washington infected with BSE in 2003, but industry representatives report that compliance is now total. Even so, critics call the partial prohibitions insufficient. Indeed, US meat producer Creekstone Farms was forcibly prevented from conducting BSE testing by the USDA, which under an obscure 1913 law had the authority to restrict sales of BSE testing kits, allegedly to protect other producers from being forced to conduct the same tests to stay competitive. Sixty-five nations implemented full or partial restrictions on importing US beef products because of concerns that US testing lacked sufficient rigor. As a result, exports of US beef declined from 1,300,000 metric tons in 2003, (before the first mad cow was detected in the US) to 322,000 metric tons in 2004. This has increased since then to 771,000 metric tons in 2007 and to 1,300,000 metric tons by 2017. With 36 confirmed cases, Japan experienced one of the largest number of cases of BSE outside Europe. It was the only country outside Europe and the Americas to report non-imported cases. Reformation of food safety in light of the BSE cases resulted in the establishment of a governmental Food Safety Commission in 2003. Evolution of the Bovine spongiform encephalopathy (BSE) epidemic in the UK. The scientific consensus is that infectious BSE prion material is not destroyed through cooking procedures, meaning that even contaminated beef foodstuffs prepared "well done" may remain infectious. In fact the infectious agent remains viable over 600 °C (1,112 °F). For this failure, France was heavily criticised internationally. Thillier himself queried why there had never been a ban on French beef or basic safety precautions to stop the food chain becoming contaminated, suggesting "Perhaps because the French government forgot its role in guaranteeing the safety of food products, and this neglect cost the lives of nine people." The Sydney Morning Herald added, "while blustering French politicians blamed Britain for the emergence of the disease – and tried to quarantine the country by banning imports of British beef – they failed to adopt measures to prevent a hidden epidemic at home." In 2016 France confirmed a further case of BSE. In October 2018, a case of BSE was confirmed at a firm in Aberdeenshire, Scotland, the first such case in Scotland in a decade. As of 18 October, the case was believed to be an isolated one, but four other animals from the same herd were being culled for precautionary reasons. Scottish officials confirmed that the case had been identified as part of routine testing and that the diseased cow had not entered the human food chain. A number of other countries had isolated outbreaks of BSE confirmed, including Spain, Portugal, Belgium and Germany. The BSE crisis led to the European Union (EU) banning exports of British beef with effect from March 1996; the ban lasted for 10 years before it was finally lifted on 1 May 2006 despite attempts in May through September 1996 by British prime minister John Major to get the ban lifted. The ban, which led to much controversy in Parliament and to the incineration of over one million cattle from at least March 1996, resulted in trade controversies between the UK and other EU states, dubbed "beef war" by media. Restrictions remained for beef containing "vertebral material" and for beef sold on the bone. France continued to impose a ban on British beef illegally long after the European Court of Justice had ordered it to lift its blockade, although it has never paid any fine for doing so. Similar wildcat bans from countries known to have BSE were imposed in various European countries, although these were mostly subsequently ruled illegal. The Economist noted, "Unfortunately, much of the crisis in Europe can be blamed on politicians and bureaucrats. Even while some European countries were clamouring for bans on British beef, they were ignoring warnings from the European Commission about how to avoid the spread of BSE in their own herds." Different hypotheses exist for the origin of BSE in cattle. One hypothesis suggests it may have jumped species from the disease scrapie in sheep, and another hypothesis suggests that it evolved from a rare spontaneous form of "mad cow disease" that has been seen occasionally in cattle for many centuries. In the 5th century BC, Hippocrates described a similar illness in cattle and sheep, which he believed also occurred in man. Publius Flavius Vegetius Renatus recorded cases of a disease with similar characteristics in the fourth and fifth centuries AD. ^ a b c d e f g h i j k Casalone, C; Hope, J (2018). Atypical and classic bovine spongiform encephalopathy. Handbook of Clinical Neurology. 153. pp. 121–134. doi:10.1016/B978-0-444-63945-5.00007-6. ISBN 9780444639455. PMID 29887132. ^ a b c d e "Bovine spongiform encephalopathy". WHO. November 2002. Archived from the original on 2012-12-18. Retrieved 27 October 2018. ^ a b c d e f g h i j "About BSE BSE (Bovine Spongiform Encephalopathy) Prion Diseases". CDC. 2 October 2018. Retrieved 26 October 2018. ^ a b c "Control Measures BSE (Bovine Spongiform Encephalopathy) Prion Diseases". CDC. 2 October 2018. Retrieved 27 October 2018. ^ "BSE in North America BSE (Bovine Spongiform Encephalopathy) Prion Diseases". CDC. 2 October 2018. Retrieved 26 October 2018. ^ a b Nathanson, Neal; Wilesmith, John; Griot, Christian (1997). "Bovine Spongiform Encephalopathy (BSE): Causes and Consequences of a Common Source Epidemic" (PDF). American Journal of Epidemiology. 145 (11): 959–69. doi:10.1093/oxfordjournals.aje.a009064. PMID 9169904. ^ "Bovine spongiform encephalopathy (BSE)". WHO. Retrieved 20 February 2019. ^ "Feed Bans BSE (Bovine Spongiform Encephalopathy) | Prion Diseases". CDC. 2 October 2018. Retrieved 27 October 2018. ^ "'All steps taken' after BSE diagnosis". BBC News. 23 October 2018. Retrieved 27 October 2018. ^ Thomson, Gavin. "Bovine Spongiform Encephalopathy (BSE)" (PDF). Retrieved 21 November 2016. ^ a b "Bovine Spongiform Encephalopathy" (PDF). The Center for Food Security & Public Health. The Center for Food Security & Public Health. August 2016. Retrieved 30 October 2016. ^ "Ataxias and Cerebellar or Spinocerebellar Degeneration Information Page: National Institute of Neurological Disorders and Stroke (NINDS)". www.ninds.nih.gov. Retrieved 2016-12-01. ^ "Bovine Spongiform Encephalopaphy: An Overview" (PDF). Animal and Plant Health Inspection Service, United States Department of Agriculture. December 2006. Archived from the original (PDF) on 8 March 2008. Retrieved 8 April 2008. ^ "Vol.1 - Executive Summary of the Report of the Inquiry". webarchive.nationalarchives.gov.uk. Archived from the original on 2009-05-05. ^ a b Budka, H; Will, RG (12 November 2015). "The end of the BSE saga: do we still need surveillance for human prion diseases?". Swiss Medical Weekly. 145: w1421 2. doi:10.4414/smw.2015.14212. PMID 26715203. ^ a b "Commonly Asked Questions About BSE in Products Regulated by FDA's Center for Food Safety and Applied Nutrition (CFSAN)". Center for Food Safety and Applied Nutrition, Food and Drug Administration. 14 September 2005. Archived from the original on 9 May 2008. Retrieved 8 April 2008. ^ I Ramasamy; M Law; S Collins; F Brook (April 2003). "Organ distribution of prion proteins in variant Creutzfeldt–Jakob disease". The Lancet Infectious Diseases. 3 (4): 214–22. doi:10.1016/S1473-3099(03)00578-4. PMID 12679264. ^ a b Espinosa, Juan Carlos; Morales, Mónica; Castilla, Joaquín; Rogers, Mark; Torres, Juan María (2007-01-01). "Progression of prion infectivity in asymptomatic cattle after oral bovine spongiform encephalopathy challenge". Journal of General Virology. 88 (4): 1379–83. doi:10.1099/vir.0.82647-0. PMID 17374785. ^ a b Balkema-Buschmann, A.; Fast, C.; Kaatz, M.; Eiden, M.; Ziegler, U.; McIntyre, L.; Keller, M.; Hills, B.; Groschup, M. H. (2011-11-01). "Pathogenesis of classical and atypical BSE in cattle". Preventive Veterinary Medicine. Special Issue: Animal Health in the 21st Century – A Global ChallengeAnimal Health in the 21st Century. 102 (2): 112–17. doi:10.1016/j.prevetmed.2011.04.006. PMID 21592603. ^ Hoffmann, Christine; Ziegler, Ute; Buschmann, Anne; Weber, Artur; Kupfer, Leila; Oelschlegel, Anja; Hammerschmidt, Baerbel; Groschup, Martin H. (2007-01-01). "Prions spread via the autonomic nervous system from the gut to the central nervous system in cattle incubating bovine spongiform encephalopathy". Journal of General Virology. 88 (3): 1048–55. doi:10.1099/vir.0.82186-0. PMID 17325380. ^ Wells, G; Hawkins, S; Green, R; Austin, A; Dexter, I; Spencer, Y; Chaplin, M; Stack, M; Dawson, M (1998). "Preliminary observations on the pathogenesis of experimental bovine spongiform encephalopathy (BSE): an update". The Veterinary Record. 142 (5): 103–06. doi:10.1136/vr.142.5.103. ^ a b c Bovine Spongiform Encephalopathy reviewed and published by WikiVet. Retrieved 11 October 2011. ^ "Detecting Prions in Blood" (PDF). Microbiology Today. : 195. August 2010. Retrieved 21 August 2011. ^ "SOFIA: An Assay Platform for Ultrasensitive Detection of PrPSc in Brain and Blood" (PDF). SUNY Downstate Medical Center. Retrieved 19 August 2011. ^ Eraña, H; Venegas, V; Moreno, J; Castilla, J (19 February 2017). "Prion-like disorders and Transmissible Spongiform Encephalopathies: An overview of the mechanistic features that are shared by the various disease-related misfolded proteins". Biochemical and Biophysical Research Communications. 483 (4): 1125–36. doi:10.1016/j.bbrc.2016.08.166. PMID 27590581. ^ Waddell, L; Greig, J; Mascarenhas, M; Otten, A; Corrin, T; Hierlihy, K (30 January 2017). "Current evidence on the transmissibility of chronic wasting disease prions to humans – A systematic review". Transboundary and Emerging Diseases. 65 (1): 37–49. doi:10.1111/tbed.12612. PMID 28139079. ^ "Feed Bans BSE (Bovine Spongiform Encephalopathy) | Prion Diseases | CDC". www.cdc.gov. Retrieved 2016-09-30. ^ "Mad Cow in Canada: The science and the story". CBC News. 24 August 2006. Retrieved 20 January 2015. ^ "Mad Cow in Canada – 1993". Parliament of Canada. Retrieved 23 August 2011. ^ "Investigators Trace Diseased Cow to Canada". The Cattle Range. 27 December 2003. Archived from the original on 11 February 2004. ^ "Mad Cow Disease". www1.nyc.gov. Retrieved 2018-08-16. ^ Becker, Geoffrey S. (11 March 2005). "Bovine Spongiform Encephalopathy and Canadian Beef Imports" (PDF). CRS Report for Congress. RL32627. ^ McNeil Jr, Donald G. (30 June 2005). "Case of Mad Cow in Texas Is First to Originate in U.S." The New York Times. ^ Rampton, Sheldon; Stauber, John (2004). Mad Cow USA (1st ed.). Monroe, Maine: Common Courage Press. ISBN 978-1-56751-110-9. ^ Barnes, Richard; Lehman, Clarence (June 2013). "Modeling of bovine spongiform encephalopathy in a two-species feedback loop". Epidemics. 5 (2): 85–91. arXiv:1511.04470. doi:10.1016/j.epidem.2013.04.001. ^ "Creekstone Farms response to USDA appeal of summary judgement" (Press release). 3buddies. 30 May 2007. Archived from the original on 28 September 2007. Retrieved 20 June 2009. ^ Seltzer, Molly (12 July 2008). "Meat Recalls to Name Retailers". The Washington Post. Bloomberg News. Retrieved 20 June 2009. ^ "Mad cow watch goes blind". USA Today. 3 August 2006. Retrieved 20 June 2009. ^ "Food Safety Citizens'Watch English Newsletter". www.fswatch.org. ^ "Statistics". Trade Library. U.S. Meat Export Federation. Archived from the original on 14 May 2009. Retrieved 20 June 2009. ^ "Statistics". Trade Library. U.S. Meat Export Federation. Retrieved 30 May 2018. ^ Weiss, Rick (1 January 2007). "Scientists Announce Mad Cow Breakthrough". The Washington Post. Retrieved 1 January 2007. ^ "S. Korea retailers halt US beef sales, govt may act". Reuters. 25 April 2012. ^ Kamisato Tatsuhiro (2005). "BSE crisis in Japan: A chronological overview". Environ Health Prev Med. 10 (5): 295–302. doi:10.1007/BF02897705. PMC 2723414. PMID 21432134. ^ "The BSE Inquiry: Home". Open.gov.uk. October 2000. Archived from the original on 2009-05-05. Retrieved 27 August 2014. ^ Pain, Stephanie (5 November 1987). "Brain disease drives cows wild". NewScientist. Retrieved 7 December 2018. ^ "Variant Creutzfeldt-Jakob Disease Current Data" (PDF). June 2014. Archived from the original (PDF) on 26 February 2015. Retrieved 11 February 2015. ^ "Mad cow disease: Still a concern". MayoClinic.com. CNN. 10 February 2006. Archived from the original on 25 April 2005. Retrieved 20 June 2009. ^ "Bovine Spongiform Encephalopathy – "Mad Cow Disease"". Fact Sheets. Food Safety and Inspection Service. March 2005. Retrieved 8 April 2008. ^ Colchester AC, Colchester NT (2005). "The origin of bovine spongiform encephalopathy: the human prion disease hypothesis". Lancet. 366 (9488): 856–61. doi:10.1016/S0140-6736(05)67218-2. PMID 16139661. ^ Mago, Chandrika; Sinha, Kounteya (2 September 2005). "India dismisses Lancet's mad cow". The Times of India. Retrieved 20 June 2009. ^ Thompson, Geoff (5 September 2005). "New theory traces mad cow disease to animal feed exported from India". The World Today. ABC. Retrieved 20 June 2009. ^ Colchester, A; Colchester, N (28 January 2006). "Origin of bovine spongiform encephalopathy – Authors' reply". The Lancet. 367 (9507): 298–99. doi:10.1016/S0140-6736(06)68062-8. ^ a b "BSE Inquiry, Statement No. 476" (PDF). BSE Inquiry. 7 May 1999. Archived from the original (PDF) on 2 January 2008. Retrieved 16 October 2008. Statement of David Osborne Hagger, Head of Abridged Licensing and Coordinator of the Executive support business of the Medicines Division of the Department of Health at Market Towers in London. ^ a b Sparks, Ian (6 November 2008). "Yes, we had mad cow disease too, France confesses". Evening Standard. Retrieved 23 September 2017. ^ Wilsher, Kim (2004-07-05). "France in denial as BSE-infected beef entered food chain". SMH.com. Sydney Morning Herald. Retrieved 23 September 2017. ^ Rousseau, Oscar (24 March 2016). "BSE-infected cow dies in France". GlobalMeatNews.com. ^ "BSE 'mad cow disease' case from Carmarthenshire". BBC. 6 October 2015. ^ "Number of cases of bovine spongiform encephalopathy (BSE) reported in the United Kingdom". World Organisation on Animal Health. 2016. Retrieved 2018-10-18. ^ Carrell, Severin (2018-10-18). "Movement ban imposed on Aberdeenshire farm following BSE case". the Guardian. Retrieved 2018-10-18. ^ "'Mad cow disease' at Scottish farm". BBC News. 2018-10-18. Retrieved 2018-10-18. ^ "Farm locked down after mad cow disease found in Scotland". Sky News. Retrieved 2018-10-18. ^ a b "Europe's mad cows". The Economist. 28 November 2000. Retrieved 23 September 2017. ^ a b "End to 10-year British beef ban". BBC News. 3 May 2006. ^ worldpressphoto.org: "1997 Photo Contest - General News, Honorable Mention prize singles: Nigel Dickinson - United Kingdom" Caption: "A cow suspected of carrying BSE is placed in an incinerator. When a link was established in England between BSE, also known as 'mad cow disease', and Creutzfeldt-Jakob, a fatal brain condition in humans, it sparked off a political row in the European Union. British beef was banned worldwide, and by the year's end over a million cattle had been destroyed." ^ "EU beef war escalates". CNNfn. 22 October 1999. Retrieved 4 June 2018. ^ "Russia to lift 16-year ban on British beef and lamb". BBC News. 22 November 2012. Retrieved 4 June 2018. ^ MacKenzie, Debora (17 March 2007). "New twist in tale of BSE's beginnings". New Scientist. 193 (2595): 11. doi:10.1016/S0262-4079(07)60642-3. Retrieved 20 June 2009. ^ McAlister, Vivian (June 2005). "Sacred disease of our times: failure of the infectious disease model of spongiform encephalopathy". Clin Invest Med. 28 (3): 101–04. PMID 16021982. Retrieved 20 June 2011.